In all, the 2014 Eastern Regional 250SX Class Champion earned a pair of top-10 finishes and notched his first 450SX Class heat race win. While his season certainly had its share of bright spots, Bogle is eager to move on. 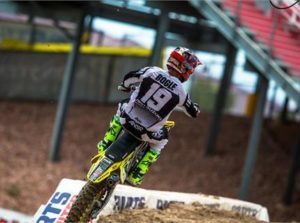 The rider of the # 19 Suzuki RM-Z450 finished sixth in his heat and raced his way into Saturday’s Main Event with a fourth-place effort in the first 450SX Class semi-final of the night. When the starting gate dropped on the 17th and final Main Event of 2017, Bogle was swallowed by the pack heading into the first turn, forcing him to play catch-up for the rest of the night. As the 20-minute-plus-one-lap feature wore on, the 24-year-old rider negotiated the challenging Las Vegas course with a workman’s effort but came up short in his bid for another top-10 result.